On invitation by the China Council for the Promotion of International Trade (CCPIT) Commercial Sub-Council, also known as the CCOIC Commercial Chamber of Commerce, and in collaboration with the China Economic Information Service of Xinhua News Agency, the China Social Organization magazine, the China Business Event Federation, and the IME Consulting Co., Ltd., PCAAE CEO & Founder, Octavio “Bobby” Peralta was one of the few panelist-participants from overseas to speak before 250 attending delegates, mostly from China. He was invited to share his experience of setting up the PCAAE as the “association of associations” in the Philippines. The conference was held on October 10, 2018, at the Marriott Hotel Northeast and was themed, “Globalization, Cooperation, and Mutual Benefit”. The event was aimed at putting together in one forum the associations and chambers of commerce to exchange ideas, strategies, and initiatives, amidst the new thrust of the Chinese government to open and transform the so-called “social organizations” in the country. Associations in China are categorized as “social organizations” which also includes chambers of commerce, foundations, and non-governmental organizations. There are over 800,000 such organizations in the country registered under the Ministry of Civil Affairs. Mr. Peralta’s panel session was entitled, “Cross-Boundary Cooperation among Associations and Chambers of Commerce”, which he shared with six other panelists from different countries. 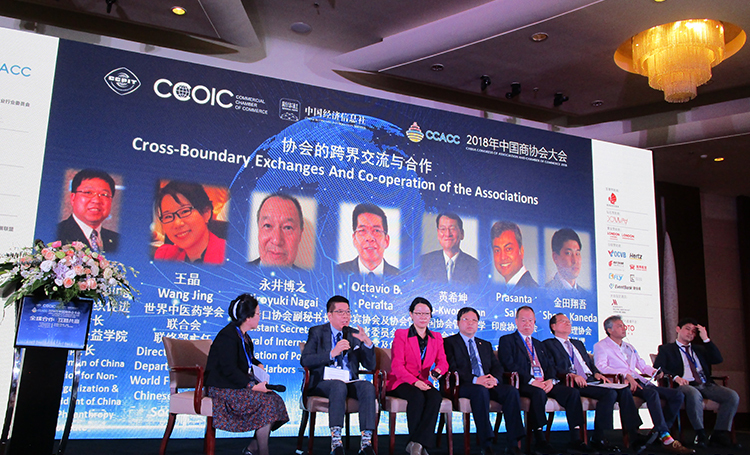 Mr. Peralta offered the following ideas for associations and chambers of commerce to undertake: (1) Knowledge hub – cooperate and collaborate together in one common platform to contribute to human talent development through joint research and educational programs – the so-called “soft infrastructure” – under the Belt and Road Initiative (BRI) which at this point focuses mostly on “hard infrastructure.” (2) Policy advocates – prepare position papers and policy recommendations toward the betterment of cross-border trade of goods and services, specifically on areas such as industry standards and ease of doing business. (3) Facilitators – organize dialogues and forums to develop association governance and management best practices, codes of conduct and ethical behavior that can be universally applicable and (4) Incubators – develop markets for products and services that can be traded across borders.